Welcome to the United Nations. It's your world. The MDG Gap Task Force, created by the Secretary-General of the United Nations, has systematically monitored existing international commitments on MDG 8 and their fulfilment at the global and country level. 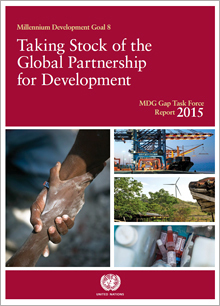 The 2015 report is entitled Taking Stock of the Global Partnership for Development.